Finding financial aid is a huge part of many students’ college search and application process. Getting good loans, scholarships, grants, and other forms of aid can make the difference between going to a first-choice college, and not going at all, so it is important for students to have access to all of the relevant information about financial aid that might be available to them. 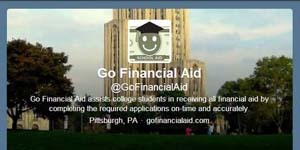 Fortunately, there is a huge community of financial aid experts, lending organizations, and even college financial aid offices on Twitter sharing excellent advice on how to go about getting financial aid. From the #FAChat hashtag to the crucial information tweeted many times daily by the government’s official @FAFSA account, Twitter is a great place to learn about financial aid, and whether you’re just diving in or have been participating in the conversation for years, you may find something new and useful on this list. 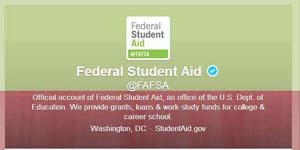 Federal Student Aid is one of the most recognized sources for financial aid material and guidance. Additionally, you can apply for aid through their site as well. 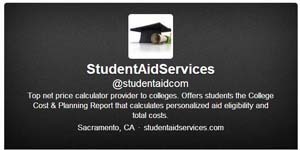 Their Twitter is a comprehensive source for aid and frequently tweets great links for student aid help. 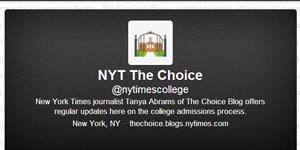 NY Times – The Choice is a great read for students looking for useful information on the college admissions process. Their Twitter regularly posts great tips, advice, and articles on the most important aspects of attending college and how to make sure the transition goes smoothly. The National Association of Student Financial Aid Administrators provides high quality resources for students looking to gain larger insight into how to navigate the financial aid process. The Twitter gives links and commentary on important financial aid issues and best equips students to successfully find the aid they need. College Financial Aid Advisors looks at the current state of student aid and helps assist students with the process to more efficiently prepare for college. 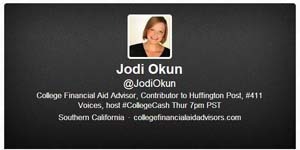 The Twitter account, run by Jodi Okun, commonly looks at different financial aid information and provides topical advice on different issues. 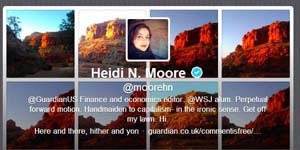 Heidi N. Moore writes for The Guardian, one of the most notable news publications in the United Kingdom. She’s the finance and economics editor, but often breaches into student financial aid issues and their overall impact. Her tweets focus on different developments pertinent to finance that are prevalent in the news. The Kauffman Foundation helps foster economic independence and prepares students to be successful in managing money before, during and after college. 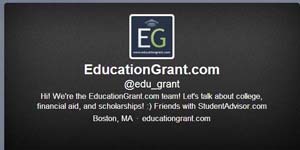 They tweet valuable articles and allow students to be empowered to make smart financial decisions. 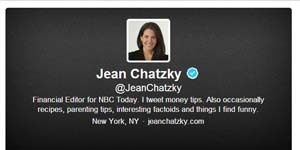 Jean Chatzky is the Financial Editor for NBC’s Today Show and tweets different financial advice, articles, and introspect. She frequently tweets about student financial aid and how to best manage money when preparing for college. 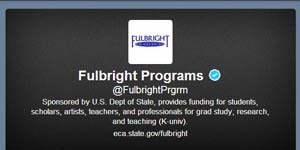 The Fulbright Program is one of the most accredited scholarship programs in the country. It’s sponsored by the US State Department and provides funding to students who are looking to fund particular endeavors around the world. Their tweets highlight different initiatives and success stories from their program. Internships.com helps students get the best internships to better their future and most adequately be prepared for the changing workforce. Their wide range of internships, with over 70,000 available, allow students to find paid internships to help supplement their income while bettering their career during college. 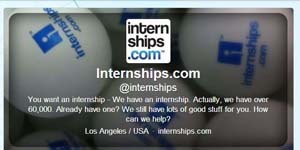 Tweets typically outline the best internships across the country and how to attain them. 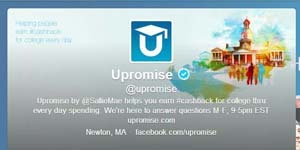 Upromise is an initiative that helps students earn money for college through regular spending. 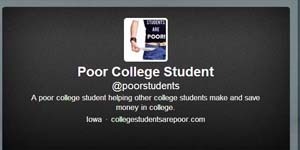 Their tweets highlight different ways students can earn money for college through things they may already be buying. Scholarship Positions looks at international scholarships, in addition to financial aid information. They regularly tweet different scholarships from different organizations around the world and how students can best implement alternative means to pay for school. Young Money Events helps students with educational sessions pertaining to financial empowerment and how to best approach paying for college. They tweet upcoming events, college aid articles, and how to stay on top of finances in college. College Success Foundation helps students in low-income, under-recognized communities finish high school, get the money for college, and empower them to succeed. 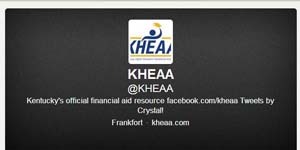 They tweet great advice and different approaches to financial aid. Needy College Students is a site that outlines the necessities for college and how students who are in need can find the resources they need to succeed. 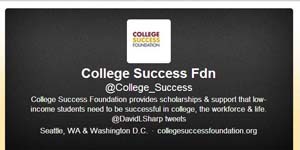 Their Twitter covers different financial aid articles and alternative ways to pay for college. Cheap Scholar is great for making the college process much more affordable and taking the complexities and making them easier to understand. 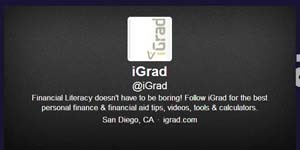 Their tweets provide great tips for financing a higher education. 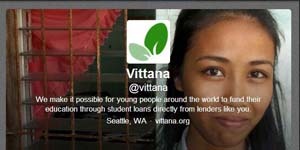 Vittana is an education loan servicer who connects young people with the student loans they need to pay for higher education. They highlight many different initiatives throughout the world through their tweets and spread the need to more widespread access of higher education. 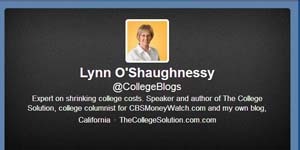 The College Solution is run by Lynn O’Shaunessy, a college advisor who regularly speaks and has a book of the same name with valuable financial aid advice. 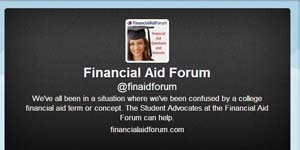 Lynn’s Twitter goes in-depth on financial aid tools and provides incredibly valuable insight on the financial aid process. 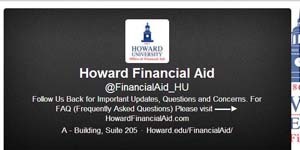 Howard Financial Aid helps students attain the skills and resources for successfully financing college. They look at less-known areas to help fill gaps in aid. Tweets typically discuss developments on the financial aid community and how to best pay for college. The Committee for Education Funding fosters an environment more intuitive for students to secure financial aid support and news pertinent to student loans. Their tweets provide a vast array of news and how to become more active in the student aid debate. iGrad focuses on helping students become financially literate as they embark on the journey to manage their own money for the first time. They explain a number of options students have for financial aid, budgeting, and how to bring about stability with finances upon attending college. Their tweets center on different approaches to saving money and the most effective ways to save. Scholarship America helps students pay for college through scholarships that have almost become a necessity in order to make college affordable. The site emphasizes the best ways to make college affordable. 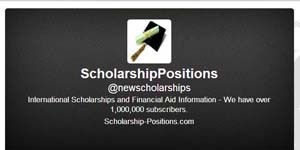 Their twitter consistently provides links to the best scholarships for students as well. Student Advisor works with those preparing and currently attending college to have the resources to succeed and prepare for financial competence throughout the process. 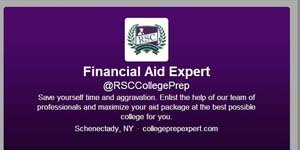 Their tweets typically encompass a range of topics pertinent to college, many times with useful financial aid advice. 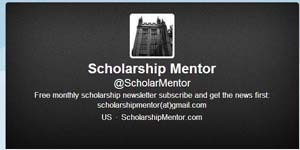 Scholarship Mentor is a monthly newsletter detailing scholarship options available to students. 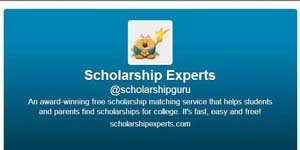 Their Twitter regularly tweets fantastic articles on different scholarships in a variety of fields. 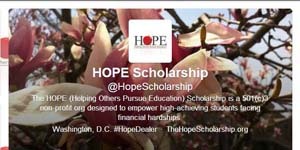 HOPE (Helping Others Pursue Education) Scholarship is a non-profit organization that helps students with less prevalent access to student aid have the means they need to be successful. Their Twitter account typically highlights the work they’re doing and how to become more integrated with the efforts they’re putting forth to get more students in college. 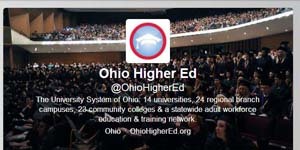 Ohio Higher Ed looks at different initiatives across Ohio that are working with residents of the state to foster more attainable college financial aid. The tweets look at developments across the state at a variety of universities and also chronicle news articles about different happenings. Scholarship Points outlines a number of scholarships that students can apply for and the best ways to be successful in applying. Their Twitter highlights different scholarships, with frequent posts on how to attain them. Poor College Student is a blog that helps those looking to attend college with great blogs and tips to pay for school. Tweets highlight different approaches, events, scholarship opportunities and more throughout the country. 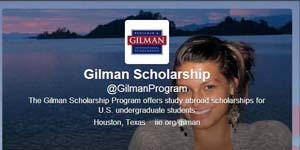 The Gilman Scholarship is for students looking to study abroad in college, but lack the supplementary income to do so. Their tweets highlight different students who have been awarded the scholarship and how students can attain it themselves. 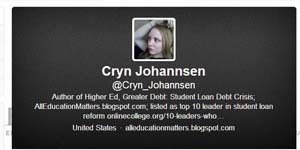 Cryn Johannsen is an author who writes about the student debt crisis and important issues affecting America’s burgeoning youth today. She tweets about different educational developments and how these substantial problems can be worked on and overcome. Pearson Students is a site where students can come to find a number of resources preparing them for college, specifically with financial aid. The Twitter supplements the site with up-to-date content and provides great advice on how to pay for school. 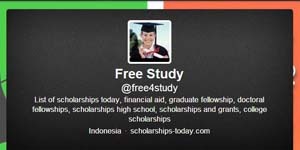 Free Study tweets many different scholarships, financial aid options, fellowships, and more. They cover a wide breadth of areas and help students locate the supplementary resources they need. 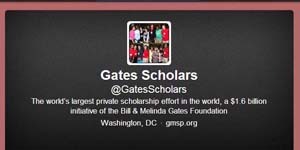 The Gates Millennium Scholars is a grant and scholarship program started by Bill and Melinda Gates. They select 1000 talented students from across the country to receive a scholarship to cover the entire cost of college. Tweets typically highlight different developments in the education field and how to best be prepared to pay for school. Sharon McLaughlin runs Head For College, which properly prepares students for successfully attaining financial aid and best being prepared for college. 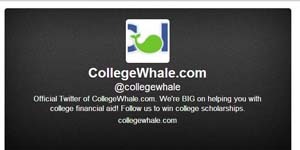 They tweet useful links to get students in college and not let financial obstacles impede their goals. 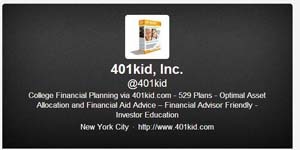 401Kid is a tool for understanding financial investment through a 529 Plan. 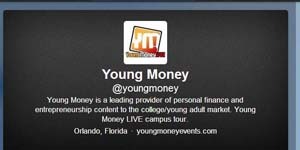 They tweet valuable advice for investing early so that a valuable portfolio will develop for financing college. 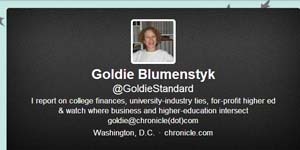 Goldie Blumenstyk is a finance writer who frequently posts about financial aid for college. She tweets great articles pertaining to financial aid, grants, and scholarships as well. 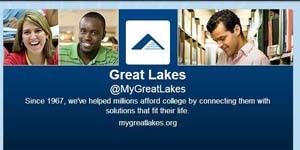 Great Lakes Student Loans helps students pay for school with quality loans and high accessibility. 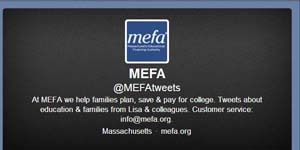 Their tweets look at the benefits of using loans for pay for school or fill in extra aid needed. CollegeWhale.com has valuable tips for building a strong road to college through financial means. Their Twitter outlines different approaches with links and news articles, all helping students have the best chance to succeed. Financial Aid Forum highlights the best implementations for securing aid for college, be it from scholarships to loans or grants. 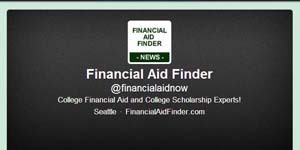 They tweet valuable tips and insight into the financial aid process and how to successfully attain financing for college. 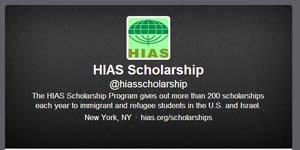 The HIAS Scholarship program is based in New York City and gives over 200 scholarships yearly to immigrant and refugee students in the United States and Israel. 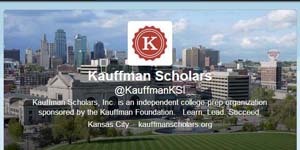 Their Twitter account highlights different events and how students can apply to be selected as a scholarship recipient. Scholarship Experts help students pay for school by locating scholarships that most closely fit students. They tweet a variety of useful scholarships covering a wide breadth of subjects and provide an intuitive manner for financing college. The Kentucky Higher Education Assistance Authority works with residents of the state seeking a college education and equips them with the know-how and resources to go to college. Their tweets highlight different scholarship opportunities and other events around Kentucky to become more involved with student aid. 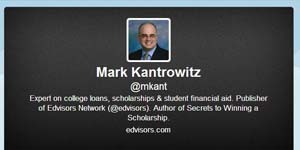 Mark Kantrowitz is the publisher for Edvisors.com, a site focused on tailoring great content for scholarships, aid, and more. Posts on Edvisors and on Mark’s Twitter account frequently highlight the best ways students can meet their educational goals without the constraints of financial inhibitions and prepares them for success. 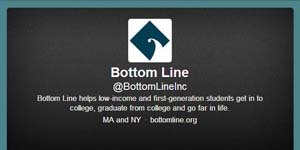 Bottom Line is a non-profit organization that works with low-income and first-generation students to ensure they have the resources and financial means to attend college. Their tweets look at different success stories and highlight how students can attain this crucial help. 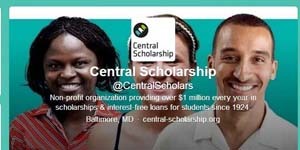 Central Scholarship is a non-profit that provides over $1 million in student aid through scholarships and interest-free loans for students around the country. Their tweets look at a variety of areas for scholarships as well. Michigan State University Financial Aid works with their students to have the scholarships, grants, scholarships, and loans to successfully attend school. 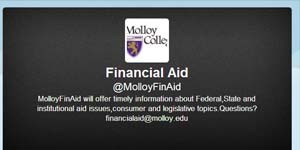 Their tweets regularly highlight important information for students who need help with the college financial aid process. The Massachusetts Educational Financing Authority helps students prepare for college at any age through insightful financial aid guidance. 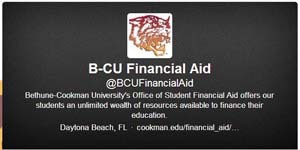 Their Twitter typically highlights the best ways to approach student loans and financial aid overall. College Possible helps low-income and first-generation students preparing to attend college with the resources and financial infrastructure to make it possible. 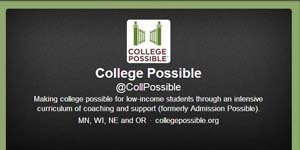 Their tweets highlight the best implementations of college initiatives. Student Aid Services is a comprehensive college planning tool that assists students with paying and planning for college. 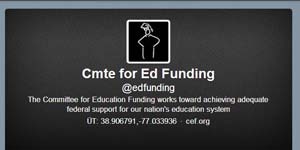 Their tweets highlight different sections of college aid pertaining to loans and scholarships. Education Grant.com provides know-how and insight on how to pay for college through different loans, grants, and scholarships from across the country. 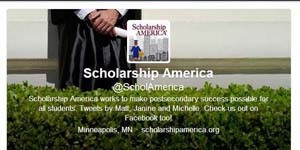 They tweet different scholarships and advice for students to pay for school. 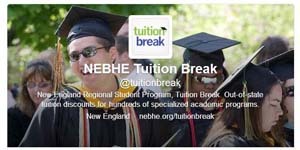 The New England Regional Student Program Tuition Break is a non-profit that assists students with securing out-of-state discounts on tuition and other academically related areas. Money College blogs about college-related financial tips that are crucial for students to navigate the increasingly difficult college financing process. Tweets are very high quality and typically cover anything relating to students and managing money. 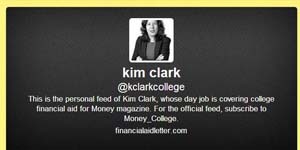 Kim Clark works for Money Magazine, focusing on their financial aid section, and provides great insight into how to be prepared and manage money for college. 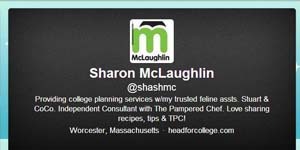 Her tweets are centered on loans and how to overcome common financial aid obstacles. 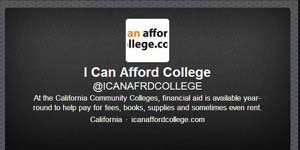 I Can Afford College is an initiative of California Community College and aims to get students into college with valuable guidance on aid, admissions, and the most pragmatic solutions to the problems they face. 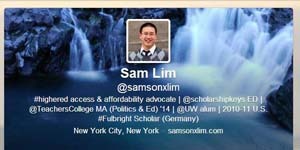 Tweets highlight scholarships, financial guidance, and even crucial legislature, such as the DREAM Act. College Money Pros help with the best ways to pay for college, with many lesser known methods that are still very effective. They typically tweet about different methods to achieving financial independence and allow students to become successful at attending college. 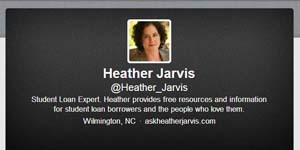 Heather Jarvis, a renowned student loan expert, works with students to make sure they are in the best situation for handling higher education finances. Her Twitter looks at different financial aid issues and she provides great commentary and advice on how to navigate the financial aid process. 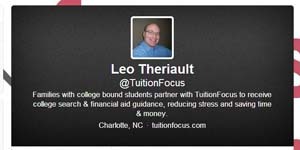 Leo Theriault runs Tuition Focus out of Charlotte, North Carolina and partners with college-bound students to get valuable financial aid guidance to prepare them for college. 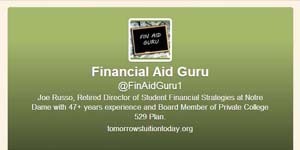 Leo tweets college financial aid advice, useful news articles, and other information pertinent to student aid. 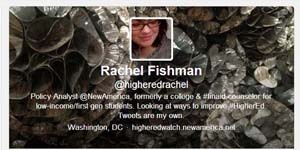 Rachel Fishman is a Policy Analyst for New America and has previously worked as a college and financial aid counselor for low-income and first generation students. 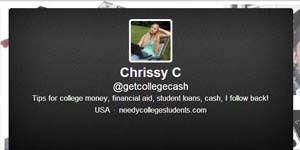 Her Twitter feed makes a great resource for gathering more information on college financial aid and how to manage paying for college. Go Financial Aid helps manage applications students must complete in order to attain aid for college. With valuable guidance and an informed team, the site is increasingly useful to students preparing for college. 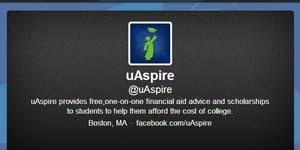 uAspire helps students with financial aid advice, for free, in an intimate and attentive manner. Their tweets look at different scholarships, uAspire’s projects, along with tuition aid initiatives across the country. 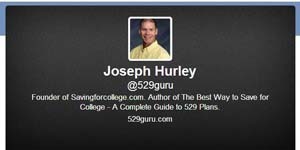 Joseph Hurley is the 529 Guru, he helps students find stability in the financial aid process and understand the best ways to approach economic aid for college. 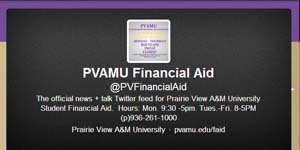 Prairie View A&M University’s Financial Aid department regularly tweets valuable tips for preparing for college, which helps students to be the most equipped for attending school in the fall. They help many students through their wide breadth of college advice and useful insight. 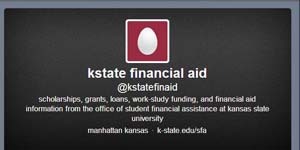 Kansas State University Financial Aid tweets financial aid information designed to help students overcome the financial burdens attending college imposes. 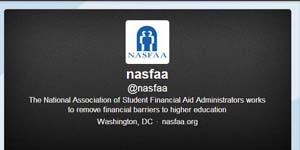 Their tweets look at FAFSA, loan disbursement, and how students can best handle finances. 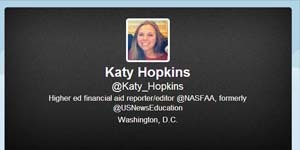 Katy Hopkins works for the National Association of Student Financial Aid Administrators as a reporter and editor of higher education financial aid. Her Twitter feed discusses the need for financial aid to evolve and how to confront contemporary obstacles for students trying to go to college. 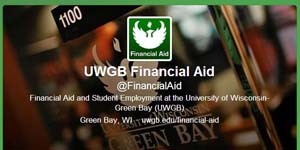 The University of Wisconsin Green Bay Financial Aid is a valuable asset to the student aid process and guides students through the most effective ways to prepare for financial success in college. 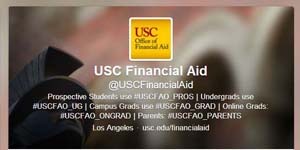 Their frequent tweeting helps keep students informed and best acclimated to the increasingly difficult battle for financial aid in college. 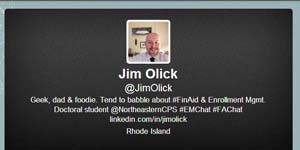 Jim Olick is a doctoral candidate at Northeastern University and his Twitter feed regularly looks at financial aid issues, in addition to enrollment management. Due to the obstacles typically confronting students preparing for college, Jim has refined a focus on pertinent solutions for financial aid and helps propagate a better environment for discussing financial aid. 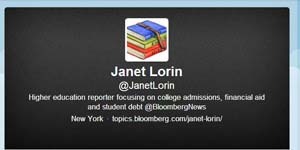 Janet Lorin is a writer for Bloomberg News and focuses on college admissions, financial aid, and educational debt. Her high-quality coverage on her Twitter feed of college financial aid, among other subjects, has propelled her to become a highly-recognized figure pertaining to college aid. 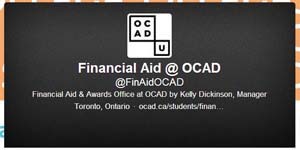 Financial Aid at OCAD highlights the most crucial information pertaining to student aid and how to effectively pay for school. Tweets cover a wide range of areas, typically relevant to financing college and how to best situate a student for the best financial outcome. Financial Aid Expert helps students preparing for college with tweets covering important news for student aid and how to best adjust to the financial challenges imposed by college. USC Financial Aid provides valuable resources for paying for school and insightful tips on how to use a FAFSA, grants, and more. They tweet great news, links, and upcoming events for college. Campus Pathway helps students who feel daunted by the process of securing aid for college and helps them best be suited to succeed in paying for school. They help students understand which colleges will be the best fit through many different parameters and which schools will help with the large cost of tuition the most. Tweets highlight the best ways to approach the process, along with links to valuable articles and tips. Financial Grants helps incorporate a variety of sources into securing aid for attending college. 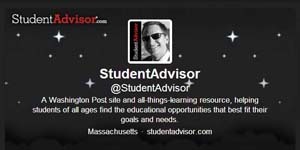 They tweet useful advice, news, and links for becoming better educated about attending college. 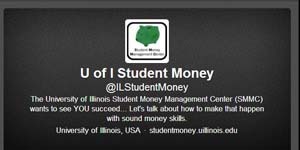 University of Illinois Student Money Management Center focuses on the best resources for students to pay for college, manage debt, and be successful financially. Their tweets look at a variety of financial aid advice for students, along with debt relief and valuable help with paying for college. Samson X. Lim is the Founder and Executive Director of Scholarship Junkies, an initiative that helps locate scholarships best suited for students and also gives them advice and essay support to secure them. His Twitter frequently highlights the most useful tips for attaining quality aid for college and making the experience much more intuitive for students. 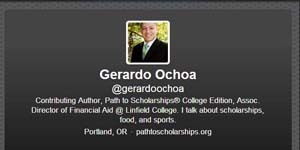 Gerardo Ochoa is a contributing author for Path to Scholarships and tweets great financial advice for students still struggling to pay for school. 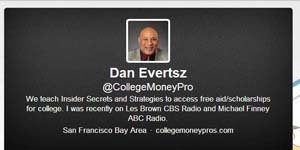 His tweets have a wide range of topics covered in them, notably including a nice array of financial advice for students. 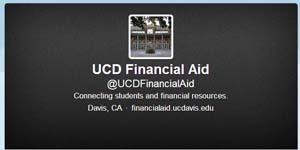 University of California Davis Financial Aid tweets valuable advice for preparing for college and how to best pay for it. They tweet about when the best time to contact financial advisors is and how to best assess how much aid is still required to comfortably attend college. 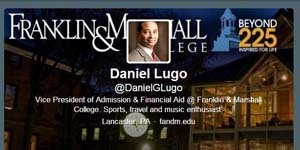 Daniel Lugo is a respected voice in financial aid and is the Vice President of Admissions and Financial Aid at Franklin & Marshall College. He tweets interesting studies and news articles relevant to financial aid and overall, he is a great source for financial aid info. 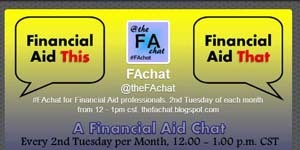 The Financial Aid Chat is a site that propagates a forum for financial aid professionals and it is held on the second Tuesday of Every Month. Their Twitter facilitates the discussion and prompts different topics for others to discuss. 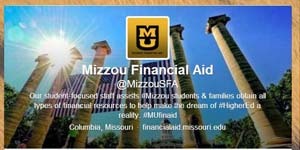 Mizzou Financial Aid tweets about financial aid articles from some of the top publications around the country. They help students also seeking help with aid through their comprehensive coverage of college aid, no matter how specific. 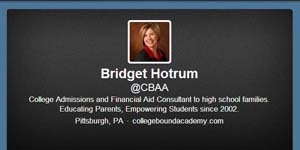 Bridget Hotrum is a College Admissions and Financial Aid Consultant for high school families preparing to send their daughter or son to college. She tweets a bunch of quality resources for attending college, along with upcoming events pertaining to student aid. Bethune-Cookman University helps students pay for school and give them access to high quality resources to understand how to best approach financing college. They underline the importance of the cost of education against eligible aid and how to fill the gap in between. 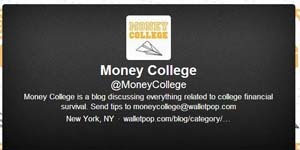 They tweet fantastic tools for helping pay for college and become best situated. 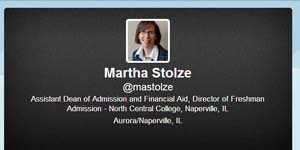 Martha Stolze is the Assistant Dean of Admission and Financial Aid at North Central College in Naperville, Illinois. She helps students be the most prepared for attending college, financially speaking, and empowers students to make the smartest decisions. 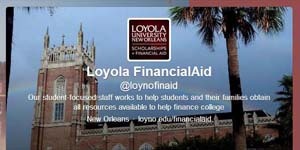 Loyola University New Orleans Financial Aid helps students utilize their wealth of information and advice on financial aid. 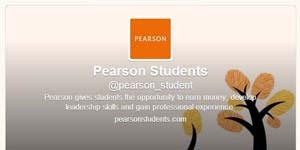 Their Twitter regularly tweets financial aid news and advice for students, many working on managing their own finances for the first time. Student Aid Saturdays encourages students to apply a small amount of free time on the weekends to becoming better educated on the college financial process and how to be best prepared. 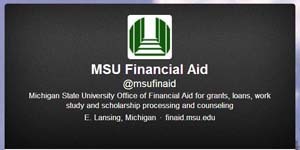 They tweet crucial tips for student aid and how to make up your mind if you’re still unsure. Based out of Seattle, Washington, Financial Aid Finder is a high quality resource for locating and applying for scholarships that best meet what a student is particularly looking for. They regularly tweet different scholarships and the best way to attain them. 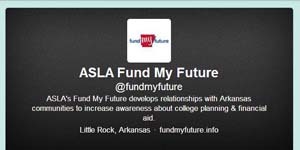 ASLA’s Fund My Future focuses on giving Arkansas families the knowledge they need to best understand financial aid for college. 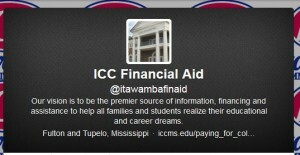 Their tweets look at many different areas of the financial aid and application process. 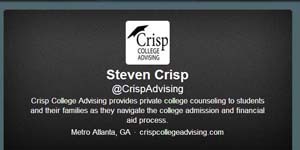 Steven Crisp is the head of Crisp College Advising. He helps point out the best procedures for not only getting into college, but for securing aid as well. 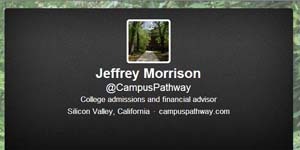 His tweets look at different admissions tricks and news articles that are highly relevant to student aid. 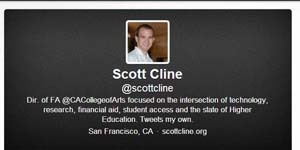 Scott Cline is a financial aid expert and is the Director of Financial Aid at the California College of the Arts. He’s well-versed in the best courses of action to attain aid and successfully complete college without mountains of debt. He frequently tweets great resources for aid and articles students will find worthwhile for attaining more aid. Power of Financial Aid is based in Wisconsin and is run by a number of educational organizations in the state. They put a strong emphasis on empowering students to pay for college and never let a lack of financial aid play a part in their ability to attend college. Their Twitter account is great for a constant stream of tips and advice from some of the leading publications in the country, but also scholarship and loan advice. 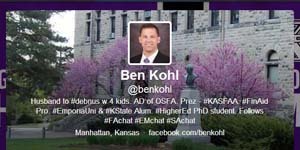 Ben Kohl is the Assistant Director of the Office of Student Financial Assistance for Kansas State University and frequently uses his Twitter to convey useful information pertaining to financial issues, as well as life at Kansas State and more. Kelchen on Education is a great site for commentary on student aid and the state of the skyrocketing cost of higher education. 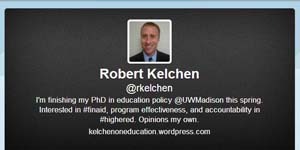 Robert Kelchen’s posts are very insightful and his useful Twitter conveys more information prospective college students will find useful. 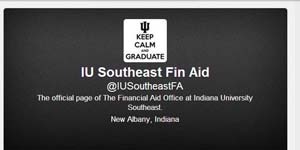 Indiana University Southeast Financial Aid is a comprehensive resource for helping students with the complex financial aid process. 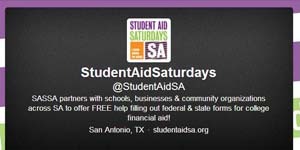 Their Twitter focuses on valuable financial aid advice and links on how to navigate specific financial aid problems. 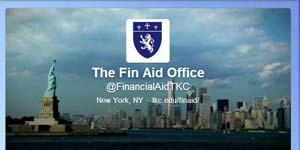 The Fin Aid Office of The King’s College in New York City helps students get the resources and applications they need to best pay for school and become situated for success. They provide great instructional and Federal Aid tips on their Twitter and regularly update students on how to be successful. Molloy Financial Aid helps students be the most prepared financially to attend college by looking at many different avenues and routes they must take in order to be successful. Tweets highlight the difficulties securing aid, but provide proficient solutions as well. 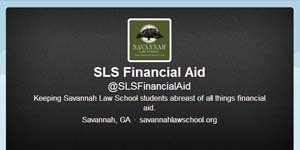 Savannah Law School’s twitter account is young yet, and mostly pertains to students at the school, but the mix of links they post, including tips about minimizing total school payments by paying interest early, and protecting your money and privacy online, is fantastic. This unassuming Twitter account from a community college does an outstanding job of curating great financial aid info from sources like Forbes, U.S. News, and Yahoo Finance. Anyone who just wants the good stuff without sorting through the other dross on many financial aid sites would do well to follow this account. 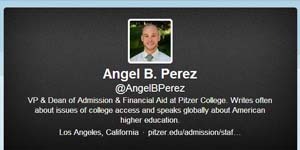 Angel B. Perez is the VP and Dean of Admissions and Financial Aid at Pitzer College. 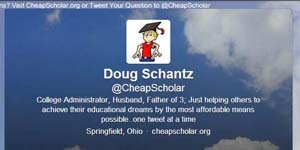 He tweets useful financial aid advice on a variety of subjects and aims to become better connected with those around him in the financial aid community. 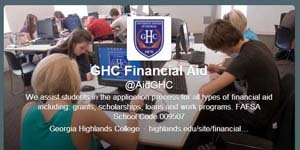 GHC Financial Aid equips students with the best resources for finding financial aid. From scholarships to grants to loans, their Twitter provides great links to different financial aid tools across the country. 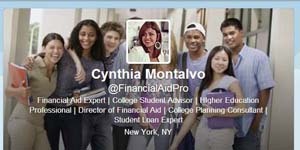 Cynthia Montalvo is a financial aid expert based in New York City who is also a Director of Financial Aid. 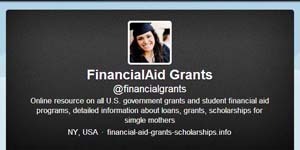 Her Twitter feed is compiled of retweets from other great college financial aid resources and news publications as they commentate on the evolving face of financial aid. Tomorrow’s Tuition at Today’s Prices explains how students can lock in tuition at current rates while still in high school. Their Twitter provides great advice and a significant wealth of knowledge for being in the best financial situation upon attending college.